Buy all new beautiful collections of designer bridal lehenga from the famous online store Rangoli. 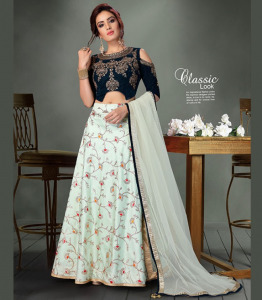 Bridal lehenga is one of the popular bridal wears flaunted by women in India and Rangoli here to provide you with the excellent quality Indian bridal lehengas which will make you look exotic and exceptional on your special day. We provide free shipping all over all over the world. Custom tailoring facility for blouse stitching also available at us. So, visit our website to have an incomparable variety of designs and colors. Contact us to make your purchase from our widest collection.